Do you remember the Everpurse iPhone charging clutch purse and handbags that we have covered here (see related links below) in the past? The company behind those products has just introduced the Everpurse Mini charging hard-shell wallet. The Mini can charge your iPhone 5/5S from zero to 100% three times. The iPhone docks right on the outside of the wallet without the need for any additional cables. While it is docked, it can be used for calls, texting or surfing. Like any other wallet, the Everpurse Mini has slots for cash, credit cards and ID and is small enough to fit inside a larger handbag or can be carried with the included wristlet and shoulder strap. The Mini has been designed for the iPhone 5/5S, but the company has plans to expand to support top selling Android phones and the iPhone 6. The Everpurse Mini is available for pre-order today at Everpurse.com and will begin shipping summer 2014. This first Mini collection is priced at $129, with an early bird price of $98 ending on May 6. 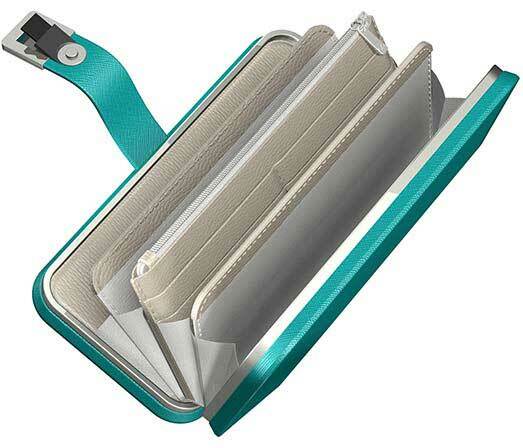 Everpurse introduces the Mini iPhone charging wallet originally appeared on The Gadgeteer on April 22, 2014 at 5:00 pm.